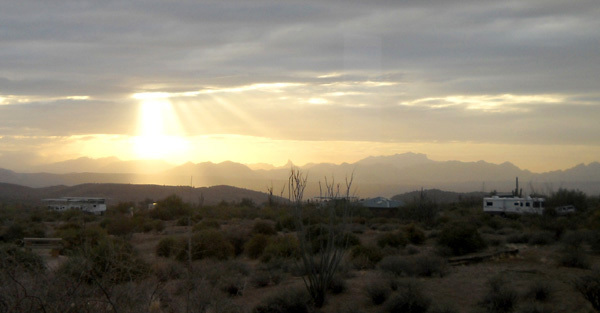 "The key to the Sonoran Desert's climate is the amount of rainfall which falls. valley is hot while up in the mountains it is cool and some mountains are even snow covered." Winter has arrived in Arizona, to the delight of skiers and the dismay of sunbirds and folks who are trying to get to Grandma's house for Christmas. Yesterday was the "shortest" day of the year for those of us in the northern hemisphere -- the winter solstice, the day with the fewest hours of light of any of the 365 days we are allotted each year. Winter is Jim's and my least favorite of the four seasons. My optimistic view, however, is that now each day will have one or two more minutes of sunshine to brighten our mood. Today we didn't have much sunshine in Arizona. The week of "severe sunshine" that I joked about a couple of days ago has come and gone. 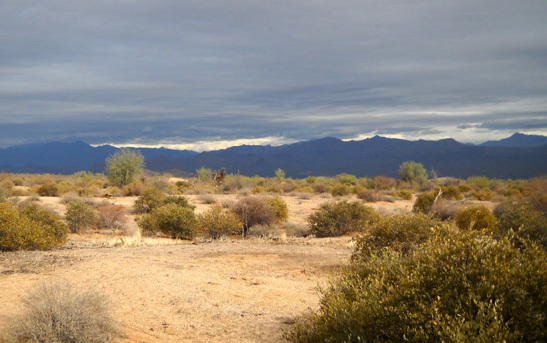 After several dry, warmer than normal days, the Phoenix area is under assault by a ferocious storm that has brought not only rain, snow, and cold air but also death and damage to folks all over the state. My brother in Ohio was the first to alert us to the sudden dust storm south of Phoenix that resulted in several deaths late this morning. He heard it on the evening news two time zones to the east and called to make sure Little Sister and Jim were OK. Thank you, Bill! 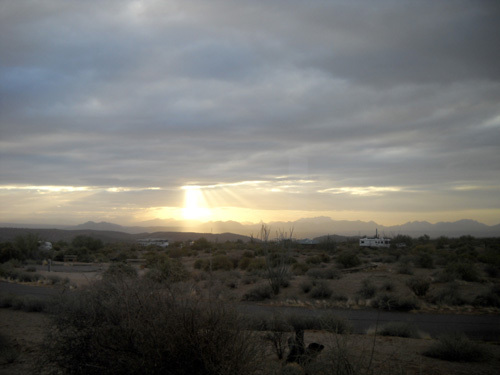 He called us just before 5 PM Mountain Time, when local TV news broadcasts begin in the Phoenix area. Sure enough, the 30+ car pileup caused by a surprise dust storm on I-10 south of Phoenix near Casa Grande, about halfway to Tucson, was the lead story on every local station and the national NBC Evening News show. The freeway was closed for several hours while the mess was cleaned up. Three or four victims were dead on the scene. Over a dozen people were airlifted to hospitals, more taken by ground in ambulances. Some of the vehicles exploded on impact and were so decimated that investigators were having a hard time even identifying the type of vehicles, let alone who was in them. Very sad. Other dust storms hit the western side of Phoenix, too. I don't know if they caused any wrecks from lack of visibility but the high winds caused some property damage. 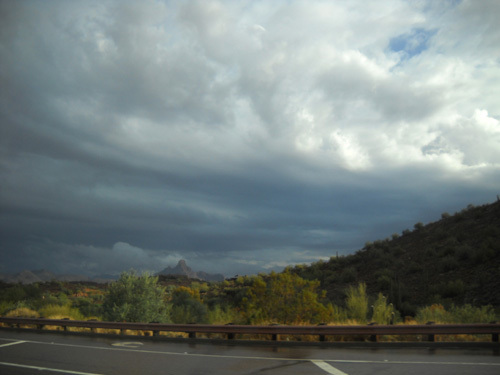 Meanwhile, farther north of Phoenix toward Flagstaff the storm brought freezing rain and snow with its high winds, creating havoc on I-17 and other roads. More pile-ups occurred when drivers slid into each other, unable to see through the blinding snow. We didn't hear about any fatalities there, thank goodness. 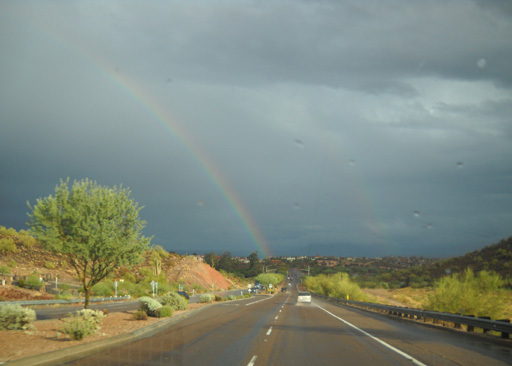 Jim and I were oblivious to the drama as we ran errands in the early afternoon in Scottsdale in eastern metro Phoenix. All we had was 1/4 to 1/3 inch of much-needed rain and some moderate wind. We lucked out and stopped grumbling about the rain as soon as we heard how bad it was for other folks only fifty miles north and south of us. 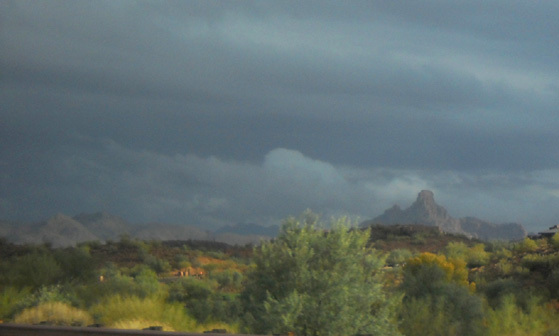 The storm system brought in much colder air to the Valley of the Sun. 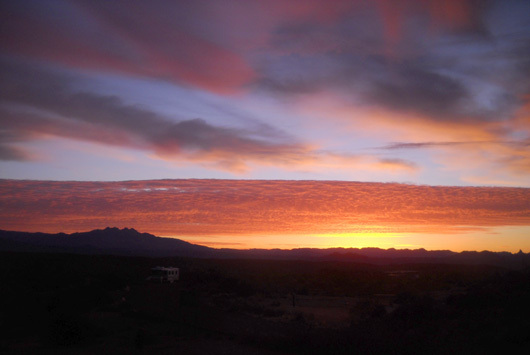 Overnight temperatures this week will be in the mid- to upper-30s in the valley and a few degrees chillier at our campground several hundred feet higher up, a definite signal that winter is upon us even in southern Arizona. At least the sunshine will return tomorrow. We'll just have to bundle up a bit more when we go outside. No more 60s and 70s until after Christmas. Highs will be only in the 40s and 50s (normal highs are in the 60s). That's OK. We've still got better weather than most of the country. We know many folks are having a very difficult time getting where they want to be this holiday week because of weather problems ranging from snow and ice to tornadoes. We're happy to be where we are for now. 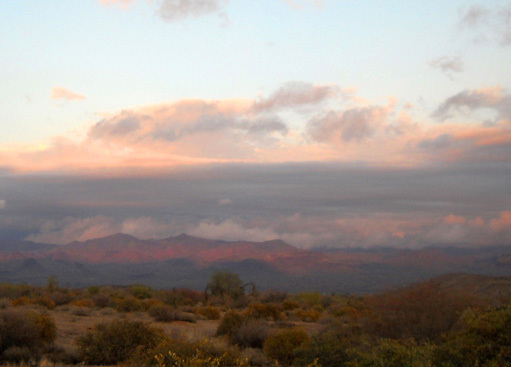 I love to watch the changing patterns in the sky from our perch in the McDowell Mountain Regional Park campground. That's one reason we like this place so much. Most of the sites are wonderful vantage points with a 360� view of the mountains around us. Well, maybe except for the Saguaro cacti! Those are a dead give-away that we're in the Southwest. To my disappointment we still haven't seen any coyotes or javelinas near our campsite. We see evidence that they have come around, we just haven't spotted them yet. We can often hear coyote choruses in the distance, both from our camper and from various points in the eastern and northern part of the park when we are running. Cody hears them but isn't very interested even when they've traipsed through our campsite on previous visits here. 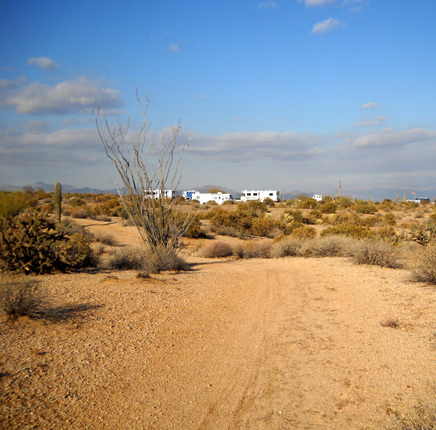 The Granite Trail passes close to the southern campground loop. One day recently Cody and I were returning to the campground on the Granite Trail (above) after running/hiking an 11-mile circuit on the Bluff and Pemberton Trails on the rocky southwestern side of the park near the McDowell Mountains. From a ridge above one of the many washes that has eroded the terrain we could hear two coyotes "talking" to each other nearby. I looked for them but couldn't see the one that was closest to us. It wasn't the high-pitched group "singing" that we usually hear, but two coyotes separated by some distance that were communicating with each other, perhaps a warning about our presence. This time Cody's fur was standing up on his shoulders. He was on full alert status. There was something about the howls this time that caused him to react differently. 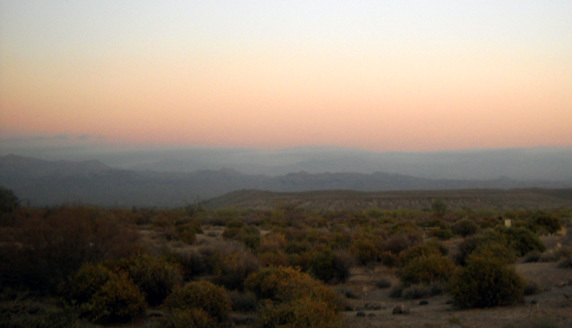 We listened to the coyotes for a couple of minutes, then moved on, fascinated with the sounds of the desert. Tonight Jim went outside after dark and saw something BIG moving across the road in front of our camper. Then he saw two more . . . horses! 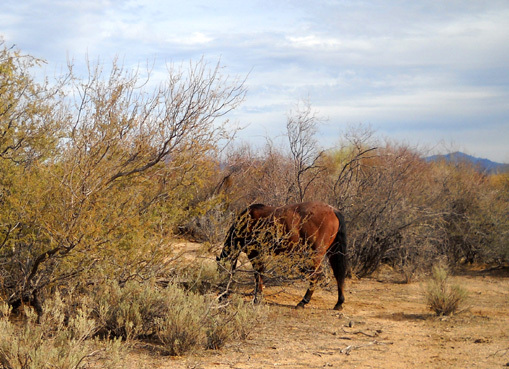 They were headed from their more remote rangeland in the park to the interior of our camping loop. We've seen them out on the trails but never in the campground before. The horses reportedly belong to a ranch on the northern border of the park and are allowed to freely graze inside the park. They appear to have the run of the whole place. They aren't really wild but they won't let us pet them, either. They eat what little grass is available. 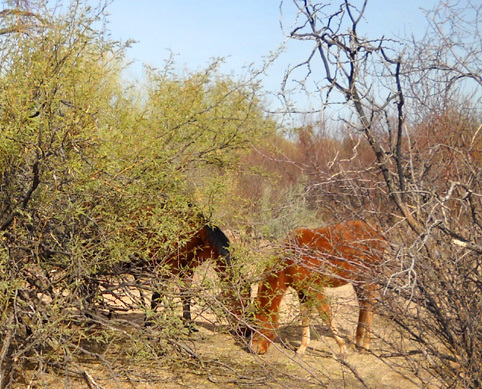 The horse hidden in the palo verde trees on the left was eating the little green leaves, which surprised me. I know that is characteristic of deer and elk. Guess I don't know much about horses!